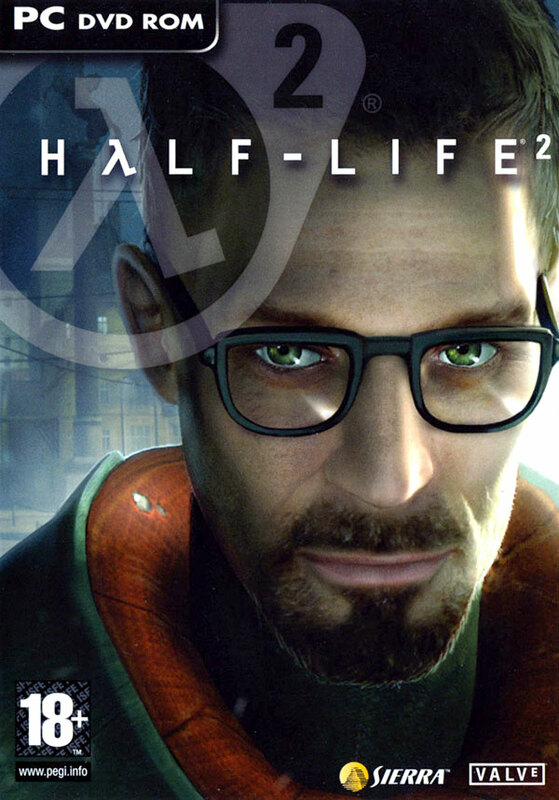 Despite recently finishing Half-Life 2 for the first time, my history with the franchise actually began with its prequel. My exposure to the PC market was somewhat limited back then, but a glimpse at the worlds that Half-Life and other first-person shooters were exploring, was nevertheless exciting to witness. When the game was slated for release on the Sega Dreamcast, it seemed my moment to enter Black Mesa had finally come. Unfathomably, the port was cancelled mere weeks away from its projected release date, and even though I would attempt to play Half-Life in the future, by then Deus Ex had taken over as the new must-play game of the day. Half-Life got lost in my own confused shuffle, though it didn’t stop me from trying Half-Life 2 in a university lab years later. That the sequel was a gorgeous and demanding game would never be in doubt, it’s just the early woes of Steam distribution and the distractions brought on by Halo 2, meant that my time would be curtailed once again. However, the streets of City 17 and its surrounding environs would be reinvigorated by Half-Life 2: Update. Featuring a vastly improved lighting system, new particle effects, and numerous bug-fixes, I knew this officially sanctioned modification would be the best way to experience the game today. 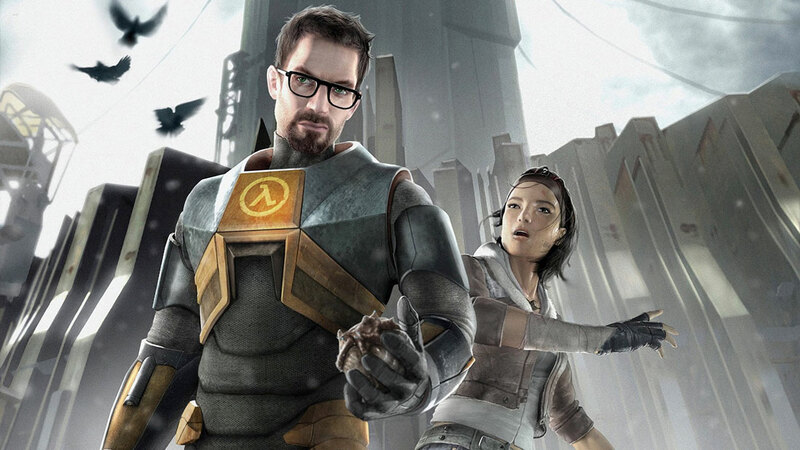 It would be foolish to ask whether it still holds up, but after 14 years of trying, would I have anything to add to the conversation that Half-Life 2 has dominated since 2004? 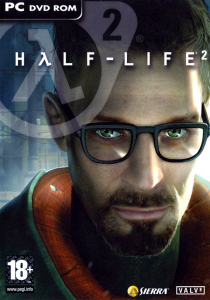 The story begins on a train, as seems to be tradition, when our silent protagonist Gordon Freeman arrives in a dystopian police state ruled by aliens. Traces of a human resistance are everywhere, yet when Gordon tries to connect with their leader, the Combine forces attack, displacing the rebels, and putting Gordon himself on notice for execution. Along the way he meets a capable young fighter called Alyx, who soon becomes a valuable ally in his attempt to free humanity from the clutches of the Combine and their chief administrator, Wallace Breen. Stepping into the world of Half-Life 2, now 14 years removed from its debut, it doesn’t take long for me to appreciate the legacy. The minimalist HUD and in-game credits are minor touches that appear minutes into the roughly 12-hour campaign; beautiful touches that have appeared in video games ever since. Also early is the moment when Gordon dons his famous orange suit – seriously, Valve does so much for this underappreciated colour! – and the subtle music that plays during this cue makes you realise how good, and how honed the experience you’re getting yourself into really is. Even the common concept of teleporting is handled with panache, as Gordon then helps his scientist buddies operate one. 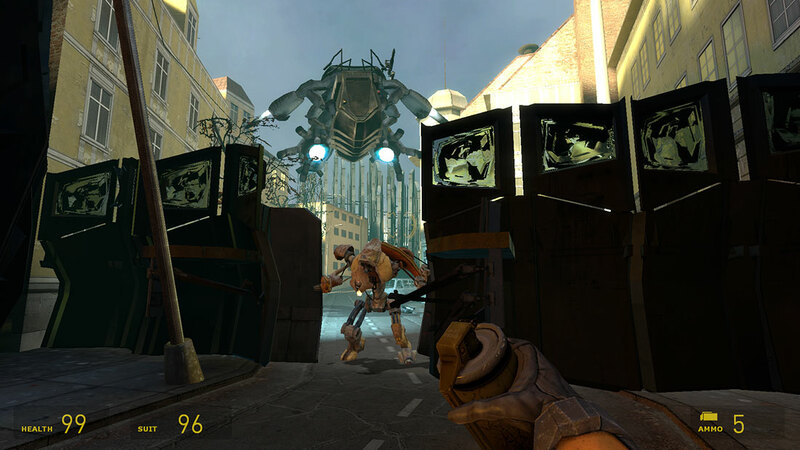 Asking the player to plug in the power cords for the teleporter is only the beginning of the sequel’s reliance on the Source Engine’s advanced physics. If there only had to be one defining feature of Half-Life 2, it would be this physics engine. It’s not just that it’s believable to see girders clanging off of enemy skulls, or bits of grating floating in bodies of water, it’s that these same quality elements are mixed into everything you do as a player. When Gordon is finally let loose on the city, all he has to his name is his trademark crowbar and a prayer. Players collect a pistol not soon after, yet it’s amazing how long players are stuck in this basic state without the game becoming tedious. Gordon spends a lot of time learning the capabilities of his humanoid pursuers, and even if their AI isn’t particularly strong by genre standards, the Combine still make for entertaining target practice. The developers weren’t afraid to place explosive red barrels everywhere, but when said barrels explode in such a violent spray of flames and sharp metal, it’s hard to care about what’s cliché. It doesn’t get old watching enemies fly the entire distance of the screen as they’re caught in a blast. The same goes for the distorted croak of their life support systems as their bodies crumple to the floor in a convincing heap. Joypad support is now included as a standard feature, although glitches still exist when it comes to quickly swapping weapons via a D-pad. The player is steadily introduced to a range of familiar weapons, with the later stages bringing more interesting toys to play with. See the futuristic crossbow that can pin enemies to walls (a fun trait that is still being copied in games like Mankind Divided), the insect membrane that summons mutant spiders to fight for your cause, and of course, the Zero Point Energy Field Manipulator; better known as the Gravity Gun. If the true spectacle of Half-Life 2 is its physics engine, then the Gravity Gun is the show’s most valuable performer. It’s a handheld device that allows Gordon to grab objects and manipulate them in diverse and exciting ways. From stacking boxes to flinging propeller blades across the room, you can get up to a lot of mischief with this innovative firearm. The outcome of several late-game puzzles and combat scenarios depend on its usage, but what’s most important to mention is how it comes along at the perfect time. Supporting NPC Alyx Vance gifts you the Gravity Gun during one of the game’s many welcome moments of respite. It’s a moment that follows a rather arduous level that sees Gordon escaping Combine air support with the aid of a hovercraft. The canal sections offer their fair share of unexpected events, though I’d say these bits do go on a pinch too long. When Gordon finally weighs anchor in Black Mesa East, the time is ripe for a change of pace with the Gravity Gun being the welcome new ingredient to get players thinking in new dimensions. As well as the Airboat, players also get to pilot a buggy during the Highway 17 chapter. The slight awkwardness of controlling the Scout Car, coupled with the chapter’s long running time, did have me yearning for Halo’s more elegant vehicle sections. Although, a nice by-product of the time spent in these sections is the giddy sense of fatigue upon reaching your destination. Each map in Half-Life 2 is broken up by the occasional loading screen, but a feeling of vastness yet remains, and once you finally step foot in Nova Prospekt, you really will have felt like you’ve driven there! It’s a brilliant journey in that sense, and the accompanying set pieces are what make that journey feel more substantial. Making a perilous walk underneath a bridge ranks as my personal high point of the entire game, in fact. It’s hard not to be perturbed by the fatal skydive that awaits those who fall. The developers also deliver a wonderful twist by obscuring the full extent of the lengthy trek until you’ve passed over the first climb. Those brigands! Things get even more hairy when you’re attacked by Combine on the way forward. It all culminates in a pitched battle against an airship that can only be downed by rockets which Gordon must skilfully shoot through the open sections of scaffold. It’s a tough bit of business, though it’s still perfectly in line with the game’s well-measured increase of difficulty. By the time you reach Nova Prospekt, things will have gotten significantly harder, and it’s a trait that continues into subsequent levels. 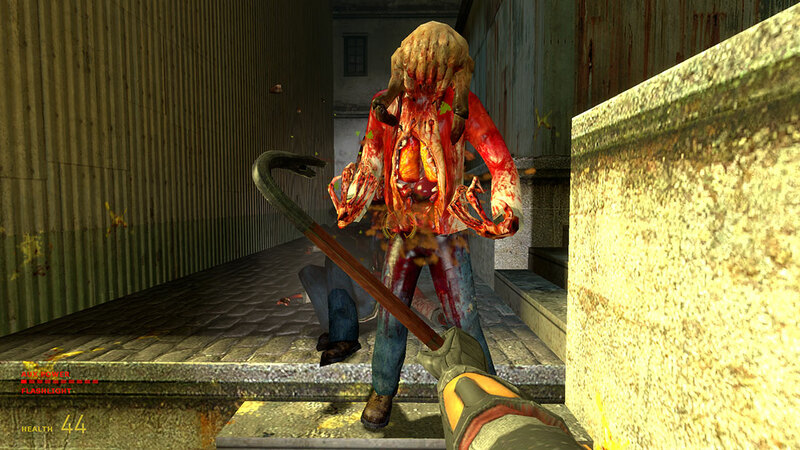 Now a staple of the genre, Half-Life 2 is notable for its heavy use of scripted sequences. The later bits where Gordon commands a squad feel half-baked, and there are a few instances where the developers ask you to make careful jumps across difficult terrain. That sort of thing is seldom suitable for the FPS formula, and Half-Life 2 does little to make me think differently. Really though, other than a hard to penetrate story (that concludes in a seriously disappointing manner), there’s not much else at fault here. Even without the pleasure of the Update mod, Half-Life 2 remains a handsome game full of good supporting characters and snappy writing. It doesn’t concern me that I can’t offer much of a unique perspective on such an already lauded title, though I can at least highlight my favourite major aspect of it all: this will be a game that is easy to remember. The substantial variety of set pieces is responsible for this desirable quality, and I’ll bet it’s not just one-time players like myself who can vividly recall their exploits. The sewer hopping in City 17’s canal. Fighting zombies in the haunted depths of Ravenholm. The aforementioned bridge walk along Highway 17. Setting up turrets to counter elite squads of Combine in Nova Prospekt. And zapping my way through countless hordes with an electrified gun in Breen’s citadel. If this really is to be considered the game of an entire decade, then it’s not hard to see why. The vaporware threequel may have become a daydream, impossible of realisation, but I’m sure fans can live with knowing Half-Life 2 is unforgettable all on its own.